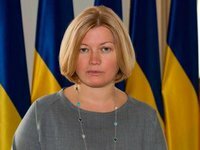 Kyiv's rep to TCG humanitarian subgroup doesn't confirm plans to exchange Sentsov for Russian citizens held in U.S.
Iryna Gerashchenko, the first deputy speaker of the Verkhovna Rada and Ukraine's representative to the humanitarian subgroup of the Trilateral Contact Group, said she has no information about alleged negotiations to exchange Ukrainian filmmaker Oleh Sentsov for Russian citizens Viktor Bout and Konstantin Yaroshenko, who have been convicted in the United States. "As for the rumors in the media about alleged talks between the Americans and the Russians on the release of Sentsov in exchange for Russian criminals, we did not hear such information from anyone during the visit to the United States or at meetings with high-ranking U.S. officials. [...] I cannot comment on the information on Oleh in Novaya Gazeta because I don't know anything about it," Gerashchenko wrote on Facebook. Ukraine will continue working on releasing the "hostages" and will fight for their release, she wrote. At the same time, neither Ukraine nor Germany and France, its partners in the Normandy Format, have information that gives them cause for hope with regard to Ukrainian citizens incarcerated in Russia, Gerashchenko wrote. "We are doing everything we can for their release. But we and our partners in the Normandy Format currently do not have any positive signals from the Russian Federation," Gerashchenko wrote. Kyiv expects the Russian presidential administration to respond to letters from Russians convicted of especially grave crimes in Ukraine who are asking to be exchanged for Ukrainian "political prisoners," she said. The Ukrainian Foreign Ministry has sent these letters to the Russian presidential administration by diplomatic pouch. Novaya Gazeta has reported that the main condition for Sentsov's return to Ukraine is the extradition to Russia of Viktor Bout and Konstantin Yaroshenko, as well as Maria Butina, who has been arrested in the U.S.